LOS ANGELES – Ten states’ strict voter ID laws may create substantial barriers to voting and possible disenfranchisement for more than 24,000 transgender voters this November. According to a new study entitled, “The Potential Impact of Voter Identification Laws on Transgender Voters in the 2014 General Election,” authored by the Williams Institute’s Jody L. Herman, Ph.D., Peter J. Cooper Public Policy Fellow, many transgender people who have transitioned do not have identification that accurately reflects their correct gender. Strict Photo ID States (figures rounded). 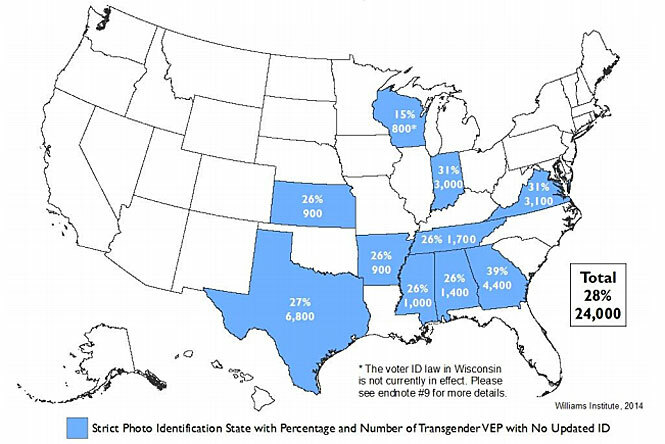 Across the ten strict photo ID states, about 84,000 transgender people who have transitioned are estimated to be eligible to vote. 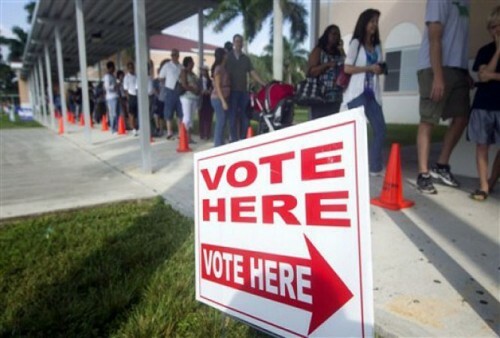 The 24,000 transgender voters who may face barriers to voting reside in the following ten states that will have or could have in place strict photo ID laws for the November 2014 general election: Alabama, Arkansas, Georgia, Indiana, Kansas, Mississippi, Tennessee, Texas, Virginia, and Wisconsin. An estimated twenty-eight percent of the transgender voting-eligible population in those ten states has no identification or records that accurately reflect their gender. Transgender people of color, youth, students, people with low incomes, and people with disabilities are likely overrepresented in that group. In order for these 24,000 voting-eligible transgender people to obtain the updated IDs required to vote in the November 2014 general election, they must comply with the requirements for updating their state-issued or federally-issued IDs. These requirements vary widely by state or federal agency and can be difficult and costly to meet. “Some voters may not have the means or the ability to present the required voter identification for a variety of reasons, such as poverty, disability, or religious objection. Transgender people have unique barriers to obtaining accurate IDs needed to vote. As these ten states begin planning for their fall elections, educating poll workers is crucial in order to ensure that transgender voters in their states have fair access to the ballot,” said Herman. The Williams Institute is an independent think tank at UCLA’s School of Law.